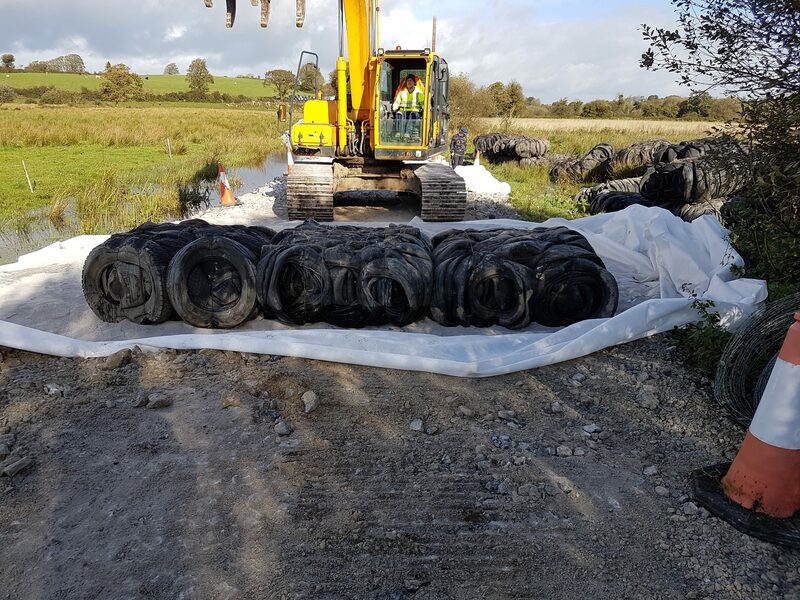 AGL Consulting carried out the design of an access road for Clare Co. Co. which consisted of using lightweight fill in the form of baled tyres to increase the road elevation of a short section of road over soft ground which had been experiencing flooding. 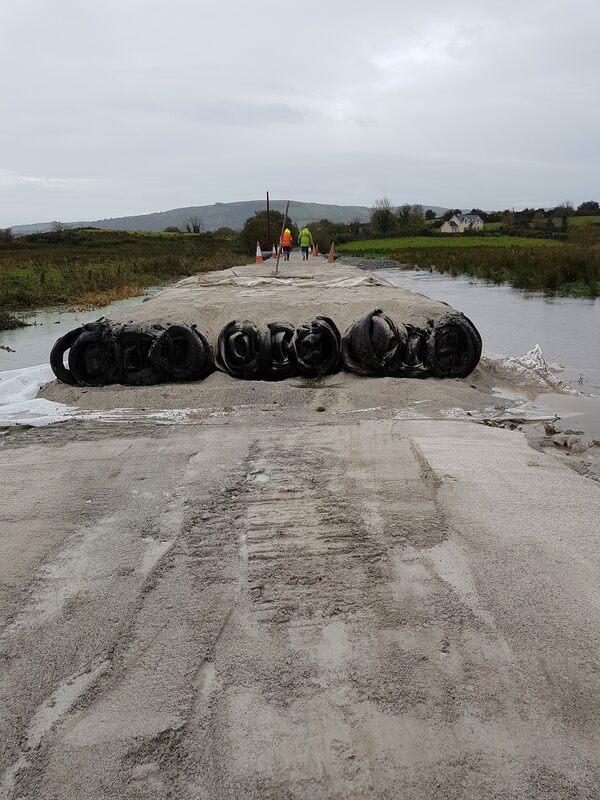 The use of baled tyres within the road embankment was considered the most cost-effective method of raising the current road level above the projected flood level at this location without inducing undue additional long-term creep settlements. The access road is the only access road to several residential houses and farms between Dooras Lough and Doon Lough in Co. Clare. 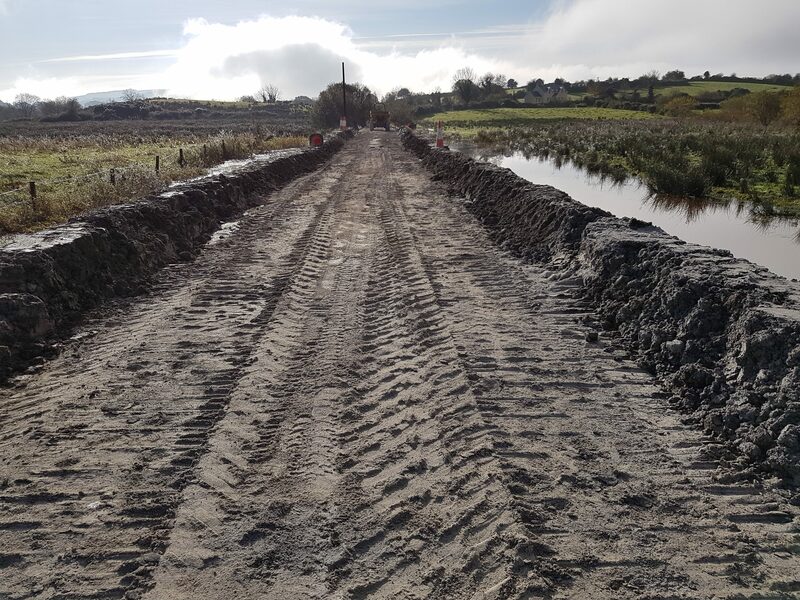 Prior to raising the road elevation, it was on an embankment of 1.2m height at its maximum over soft ground comprising significant depths of very soft peat and silt/clay. 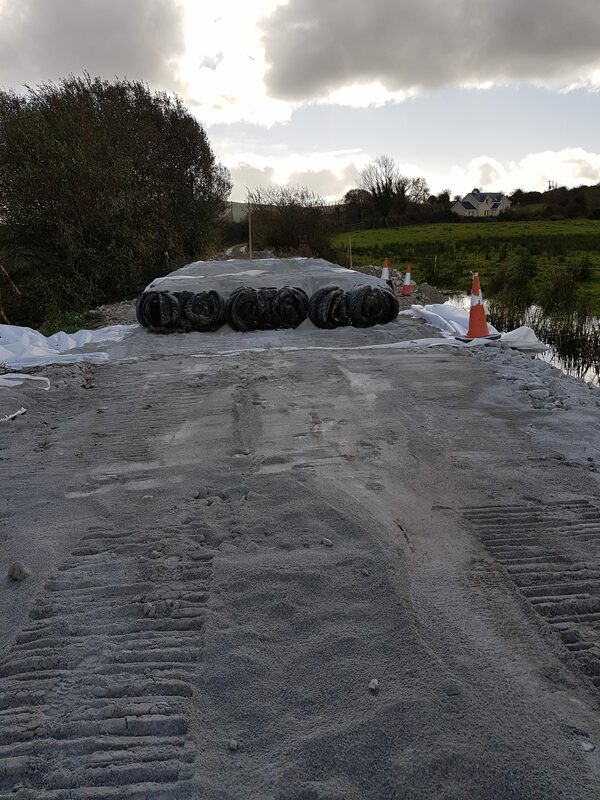 The access road was prone to flooding under flood conditions, preventing access and exist to and from the houses and farms. The design was carried out in accordance with PAS 108:2007 – Specification for the production of tyre bales for use in construction. According to PAS 108 2007, data amassed over more than 30 years concerning the potential impacts of used tyre materials on human health and the environment indicates that they are neither hazardous nor dangerous. However, a Licence under Part V of the Waste Management Acts 1996-2008 is required and was attained for the project. The design consisted of stripping some of the existing embankment material and using it as berms, placing a regulating layer of Terram at the stripped level, followed by a regulating layer of sand, then a layer of tyre bales, and then wrapping the Terram over the top of the bales with an overlap of 1m. Each baled tyre measures approximately 1.50m x 1.30m x 0.75m and comprises in the region of 100-120 car tyres compressed into rectangular blocks; galvanised high tensile steel wires are used to contain the baled tyres in their compressed size and shape.